According to bettors participating in pool two of the Breeders’ Cup Classic Future Wager, Accelerate is the one to beat in the Grade I, $6 million Classic at Churchill Downs on Nov. 3. Trained by John Sadler, Accelerate was the 3-1 favorite in the second BC Classic future pool that closed last Sunday. Interestingly, the 5-year-old Kentucky-bred son of Lookin At Lucky also closed as a 3-1 favorite in pool one in late August. I think the fact that Accelerate’s BC Classic price has not fluctuated from the Aug. 26 pool to the Oct. 7 pool perhaps can be attributed to how people have evaluated his win in Santa Anita’s Grade I Awesome Again Stakes on Sept. 29. Some folks seem eager to take a stand against Accelerate in the BC Classic after what they saw of him in the Awesome Again. 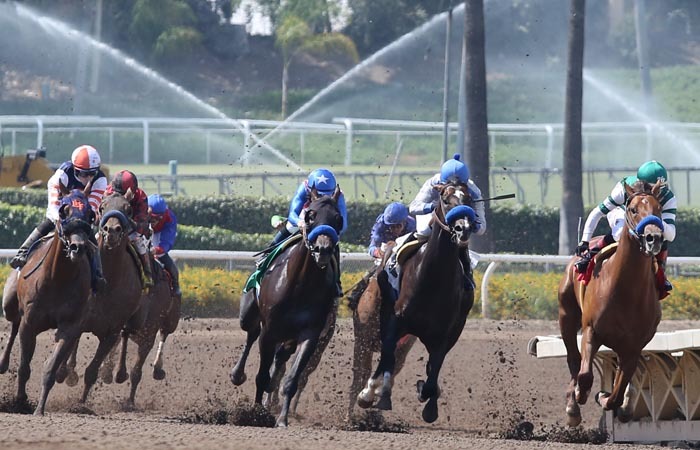 He won the 1 1/8-mile Awesome Again by 2 1/2 lengths and recorded a 100 Beyer Speed Figure. It was a far cry from his brilliant 12 1/2-length triumph and 115 Beyer in Del Mar’s Pacific Classic at 1 1/4 miles on Aug. 19. But it also seems that many people are perfectly willing to back Accelerate in the BC Classic. They note that Accelerate had to overcome a lot in the Awesome Again. Despite throwing a tantrum at the starting gate, a sluggish beginning and a wide trip, he won going away. Regardless of whether you are for or against Accelerate in the BC Classic, he ended up being the clear-cut favorite at 3-1 in pool two of the Breeders’ Cup Future Wager. Closing as co-second favorites at 6-1 were a pair of runners trained by Hall of Famer Bob Baffert, McKinzie and West Coast. Their odds have dropped considerably from pool one when West Coast was 12-1 and McKinzie was 19-1. The reason that the prices for McKinzie and West Coast have dropped since Aug. 26 is they both subsequently ran races that suggested they could be major players in the BC Classic. McKinzie won the Grade I Pennsylvania Derby at Parx on Sept. 22 in his first start since March 10. West Coast, in his first start since March 31, finished second to Accelerate in the Awesome Again. McKinzie, a 3-year-old Kentucky-bred Street Sense colt, has five wins and a second from six career starts. West Coast, 4-year-old Kentucky-bred Flatter colt, has six wins, five seconds and a third from 12 lifetime starts. West Coast has BC Classic experience. He finished third behind Gun Runner and Collected in the 2017 edition of the race at Del Mar. Mind Your Biscuits’ odds plummeted to 15-1 in pool two of the Breeders’ Cup Future Wager after he was 40-1 in pool one. The 5-year-old New York-bred son of Posse rolled to a 4 3/4-length victory for trainer Chad Summers in Churchill Downs’ Grade III Lukas Classic at 1 1/8 miles on Sept. 29. Summers has said three Breeders’ Cup races are under consideration for Mind Your Biscuits: the $6 million Classic at 1 1/4 miles, $2 million Sprint at six furlongs and $1 million Dirt Mile. My guess is Mind Your Biscuits’ connections will opt for the Classic. Catholic Boy, conditioned by Jonathan Thomas, has reeled off three straight victories. The 3-year-old More Than Ready colt won the Grade III Pennine Ridge on the grass in June at Belmont, the Grade I Belmont Derby on the turf in July, then the Grade I Travers Stakes on the dirt in late August at Saratoga. According to Daily Racing Form’s David Grening, Catholic Boy skipped a scheduled workout last week due to a temperature. By the way, while on the subject of future wagering, a recent CDC Gaming Reports article reported that John Avello has moved to DraftKings after 13 years as the Race & Sports Book director at the Wynn in Las Vegas. This column often has listed Avello’s future book odds for both the Kentucky Derby and BC Classic in recent years. With Avello now gone, the word is that the Wynn has no plans to offer future wagering on the 2019 Kentucky Derby. This no doubt is a big disappointment to many, including yours truly. A pair of female Thoroughbred superstars won at the Group I level in Australia and France last weekend. First it was Winx on Saturday. The following day it was Enable. Extending her winning streak to 28, Winx unleashed yet another powerful rally to capture the Group I Turnbull Stakes at 2,000 meters (about 1 1/4 miles) at Flemington Racecourse in Melbourne. Regular rider Hugh Bowman once again piloted the amazing mare. Winx’s legion of fans did have some anxious moments, though. Winx’s “positioning was problematic” for much of the race, Leo Schlink wrote in his Turnbull recap for the Herald Sun. Winx raced next-to-last early in the field of eight. When still next-to-last while behind a wall of rivals swinging into the straight, Winx no doubt left many wondering if perhaps she might never get a clear path. With about three-sixteenths of a mile left to run, Bowman seemed to be probing for a seam. He found one with a little more than a furlong to go. Once Winx had a clear path to the finish, she again generated impressive acceleration and stormed past six rivals in the final furlong to win by one length. Some criticized Bowman for this ride. Winx’s trainer, Chris Waller, did not. It was “a picture-perfect Hugh Bowman ride,” Waller was quoted as saying in Schlink’s recap. However, Waller did concede that Bowman and Winx needed “a bit of luck” in the straight when there was a wall of opponents spread out across the course in front of the overwhelming 1-10 favorite. Bowman admitted all did not go as he had hoped. Waller expressed the sentiment that Winx now is set up beautifully for her next start in the prestigious Group I Cox Plate at Moonee Valley on Oct. 27. The Cox Plate, at the same distance as the Turnbull, is Australia’s premier weight-for-age event. Winx will be attempting to become the first four-time Cox Plate winner. Kingston Town is the only horse besides Winx to have won the Cox Plate three times. Winx’s 28 wins in a row is the record for an Australian-based Thoroughbred. The record had been 25 straight set by Black Caviar, another marvelous mare. Black Caviar retired in 2013 after winning all 25 of her starts. A 7-year-old daughter of Street Cry, Winx has won 32 of 38 career starts. Street Cry also is the sire of America’s 2010 Horse of the Year Zenyatta, who won 19 of 20 career starts. Zenyatta reeled off 19 straight wins before losing the Grade I BC Classic by a head to Blame in 2010 at Churchill Downs. Winx now has 21 Group/Grade I victories to her credit, a world record for a Thoroughbred on the flat. Second with 16 such wins is America’s legendary gelding John Henry. The Irish hurdler Hurricane Fly won 22 such races in Europe from 2008-15. The longest winning streak in the history of Thoroughbred racing is held by Camarero, who won 56 straight in Puerto Rico from April 1953 to August 1955. Camarero, who became Puerto Rico’s first Triple Crown winner in 1954, was victorious in 73 of 76 career starts. Kincsem, foaled in 1874, holds the record of 54 consecutive victories by a female Thoroughbred. Kincsem raced in Austria, England, France, Germany, Poland and Romania in addition to her native Hungary. She won 10 races as a 2-year-old, 17 as a 3-year-old, 15 as a 4-year-old and 12 as a 5-year-old. Kincsem was victorious at distances ranging from a half-mile to 2 5/8 miles. After Winx’s latest win in Australia, Enable made it nine victories from 10 career starts when she captured the prestigious Group I Prix de l’Arc de Triomphe at 2,400 meters (about 1 1/2 miles) on Sunday at Longchamp in Paris. Enable obviously is a tremendous filly. But even so, it took a training job for the ages by John Gosden and a masterful ride by the ebullient Frankie Dettori for Enable to come away with a narrow 2018 Arc victory. This close call was in stark contrast to Enable’s dominant 2 1/2-length Arc triumph in 2017 as a 3-year-old when the race was held at Chantilly because Longchamp was being renovated. In this year’s Arc, Enable lurked within close range of the early lead, then charged to the front with a little more than a furlong to run. She kicked clear in the final furlong, but won by only a small margin when having to stave off the onrushing Sea of Class, a 3-year-old filly who certainly ran a huge race in defeat. Next-to-last early among the 19 starters, Sea of Class still was behind 17 rivals or so with about three furlongs left to run. Sea of Class had to work her way through traffic in the straight before getting into the clear to make a run in the final quarter-mile. She then roared home to lose by just a neck. For Sea of Class to get so close only to taste defeat was rather cruel, especially inasmuch as her pedigree makes it seem as if she’s destined to become an Arc winner. Sea of Class is a daughter of 2009 Arc winner Sea the Stars, whose dam is 1993 Arc winner Urban Sea. But then it’s not as if there aren’t any Arc winners in Enable’s family tree. Enable’s sire, Nathaniel, is a grandson of Urban Sea. Enable’s dam is Concentric, a great-granddaughter of 1971 Arc winner Mill Reef. You also can find Ribot, a two-time Arc winner, in Enable’s pedigree. Speaking of Urban Sea, a quarter of a century after her Arc triumph, consider her mind-blowing achievement in this year’s Arc. The Racing Post’s Martin Stevens pointed out that the late daughter of Miswaki is the granddam or great-granddam of the runners to finish first through eighth in this year’s Arc (Enable, Sea of Class, Cloth of Stars, Waldgeist, Capri, Salouen, Kew Gardens and Nelson). By virtue of Enable’s victory last Sunday, she joined Ribot and six others as a two-time Arc winner. No horse has won it more than twice. Gosden trained for a number of years in Southern California during the early 1980s. The Cambridge University graduate first gained attention on the world stage as a trainer when he won the inaugural BC Mile at Hollywood Park in 1984 with Royal Heroine. That talented 4-year-old filly polished off males that afternoon in the time of 1:32.60, a clocking that broke the American record for a mile on the turf. Gosden said, in his opinion, it was Ribot, who won all 16 of his career starts, including those back-to-back Arcs for trainer Ugo Penco. And now, all these years after Gosden told me he felt Ribot was the greatest of all racehorses, the gentlemanly and articulate horseman has joined Penco in the exclusive club of those to have trained a two-time Arc winner. Enable’s sire was a two-time Group I winner in England for Gosden. Nathaniel also finished second, just a half-length behind Frankel, in a one-mile maiden race at Newmarket in 2010. Frankel won all 14 of his career starts. In Frankel’s 14 victories, nobody ever finished closer to him than Nathaniel. Winning Arcs is beginning to become business as usual for Gosden. He now has won three of the last four. In addition to the back-to-back Arc wins by Enable, Gosden sent out Golden Horn to take the 2015 renewal. As for Dettori, his record number of Arc victories is up to six: Lammtarra (1995), Sakhee (2001), Marienbard (2002), Golden Horn (2015) and Enable (2017 and 2018). No other rider has won the Arc more than four times. After Enable’s win last Sunday, Detorri said the Enable who won the 2018 Arc was not as good as the Enable who won the race in 2017. Detorri also marveled at what Gosden did this year to win the Arc with Enable. Two of the most phenomenal training jobs I’ve ever seen have occurred this year. In the United States, Baffert demonstrated yet again what an outstanding trainer he is by winning the Kentucky Derby with Justify. It was the first time a horse had won the Run for the Roses without having started as a 2-year-old since Apollo in 1882. Justify would go on to become the first Triple Crown winner in American racing history who did not race at 2. And now Gosden has demonstrated yet again what an outstanding trainer he is by winning this year’s Arc with Enable in just her second start of the year. In Enable’s one 2018 race prior to the Arc, she registered a 3 1/2-length victory in the Group III September Stakes at 1 1/2 miles on a synthetic surface at Kempton in England. Twenty-nine days after the race at Kempton, Enable succeeded in the Arc. Prince Khalid Abdullah (who races as Juddmonte Farms in the U.S.) bred and owns Enable. Enable’s owner also bred and raced the aforementioned Frankel. Marcel Boussac became the first owner to win the Arc six times: Corrida (1936 and 1937), Djebel (1942), Ardam (1944), Caracalla (1946) and Coronation (1949). Enable’s owner now has a record-tying six Arc wins to his credit: Rainbow Quest (1985), Dancing Brave (1986), Rail Link (2006), Workforce (2010) and Enable (2017 and 2018). The BC Turf at 1 1/2 miles on the grass Nov. 3 at Churchill Downs might be next for Enable, according to Gosden. If Enable does come to the U.S. for that race, she will attempt to become the first Arc winner to ever win the BC Turf. Gosden also broached the possibility that Enable would continue racing in 2019 to try and become the first three-time Arc winner. “It’s up to Prince Khalid,” Gosden said.